Will IMF’s response to UN report on women’s economic empowerment change its policies? The approach the IMF and a number of member states have recently taken to address gender inequality appears to be mostly instrumental, rather than anchored in a human rights-based approach that frames the achievement of gender equality as a goal in and of itself. The report I submitted a few weeks ago to the United Nations General Assembly, building on decades of feminist work and analysis, documents the shortcomings of this approach and how austerity, still often prescribed by the IMF, continues to hit women hardest. The instrumental approach is in serious conflict with the intrinsic importance of gender equality as a key component of human rights standards, particularly in light of the economic policies proposed and promoted by international financial institutions (IFIs) in recent years. While some research shows that securing certain human rights is good for growth and for the distribution of its benefits, there is no conclusive evidence to show that gender equality is always good for growth. In fact, other evidence shows that gender inequality can be conducive to some forms of economic growth. Cambodia, for example, has seen impressive economic growth over the last two decades, attributed to garment and footwear exports, which account for a massive 80 per cent of its export earnings. While the labour force for this industry is composed almost entirely of women, the gender wage gap in the country more than doubled between 2004 and 2009, raising the question of whether Cambodia’s competitive advantage is reliant at least in part on the very structures that maintain and exacerbate gender discrimination and inequality. Even in 2018, the IMF and World Bank continue to prescribe policies that undermine gender equality and the fulfilment of women’s human rights. While instrumental justifications could in theory complement human rights-based arguments if governments actually ensure that the fruits of growth are fairly distributed, global trends suggest that this is not happening and that we are moving towards ever increasing inequality. The Structural Adjustment Programmes of the IMF and the World Bank of the 1980s and 1990s were criticised for imposing harsh austerity measures that significantly and disproportionately impacted the poor and exacerbated inequality, including gender inequality. Yet, this is not just a critique of the past, because even in 2018, the IMF and World Bank continue to prescribe policies that undermine gender equality and the fulfilment of women’s human rights (see Observer Summer 2017, Spring 2018). Some of these include targeting food subsidies, privatising public utilities, downsizing social safety nets, and lowering public wages and the number of public jobs, along with labour deregulation, reductions in pensions, public service cuts and regressive tax regimes through the introduction of, or increases in, VAT, while reducing corporate tax rates (see BWP briefing, The IMF and Gender Equality and VAT). The effectiveness of the IFIs’ approach to gender equality also raises important questions that are relevant to ongoing policy debates, such as the reduction of coverage of social protection benefits, contracting fiscal space for social services and investments in mega-infrastructure projects over those that are sustainable and gender-responsive. The IMF’s failure to address structural barriers to women’s enjoyment of economic and social rights, like violence against women and girls, and its continued silence about the impacts of illicit financial flows, regressive tax regimes and privatisation of public services that affect women’s human rights also reflect the IMF’s blind spots when it comes to gender just policy interventions. Meanwhile, the IMF’s ‘gender work’ remains largely centred on the positive growth effects of closing gender gaps in labour force participation. While it might be the case that a specific policy that encourages women to enter into the paid labour force is good for growth, if entry is not on equal terms with men and no attention is paid to internationally agreed standards of ‘decent work’, it could lead to the reinforcement of gender inequality by building an economy around embedded structural inequalities in labour markets. Similarly, while the 2016-2023 Gender Strategy of the World Bank takes into account some barriers to women’s economic participation, some argue that a more comprehensive understanding of women’s economic empowerment in work-related areas would be needed to achieve substantive equality, and that the Bank continues to push for the same macroeconomic policies as the IMF. 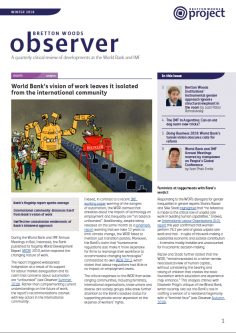 The 2019 World Development Report on the changing nature of work constitutes the latest example of the Bank’s pro-business, growth-led agenda that undermines labour rights and gender equality, about which I wrote a letter to the Bank in August (see Observer Winter 2018).